A popular twin keeled cruiser! Engine serviced annually by owner and very reliable! Two batteries renewed in last two years. The saloon table lowers to offer a double berth option in addition to the fore cabin double. There is a quarter berth to starboard. The Pageant is the smaller sister to the legendary Westerly Centaur and as such is a capable little cruiser, ideal for coastal and estuary jaunts. In the right hands and right conditions of course. she is perfectly capable of adventuring further afield, Ireland and Scillies anyone? 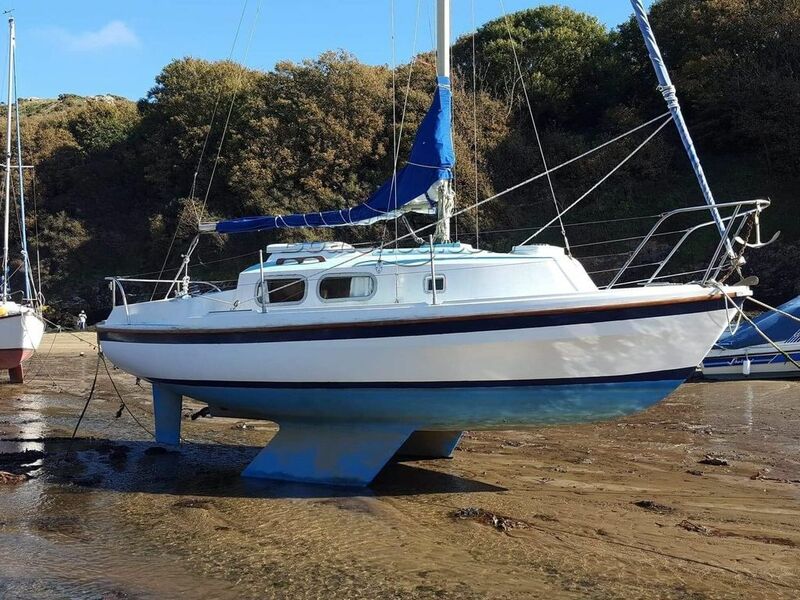 This little yacht has been well maintained and much loved by her current owner of twenty years and she is in 'laid up ashore' mode at the moment with soft furnishings, sails, vhf and batteries stored at home but available to view. Just one observation from me, I have rarely seen such an unmarked and well maintained gelcoat on a boat of her years and her motor also looks very well maintained for her age. Now afloat on her summer mooring, easily viewed by arrangement. This Westerly Pageant has been personally photographed and viewed by Alan Coy of Boatshed Wales. Click here for contact details. Yes the above Pagent is still available. Due to be launched on April 8th. Please can you tell me if this Pageant is still available. If so, what are the viewing arrangements? Thank you.